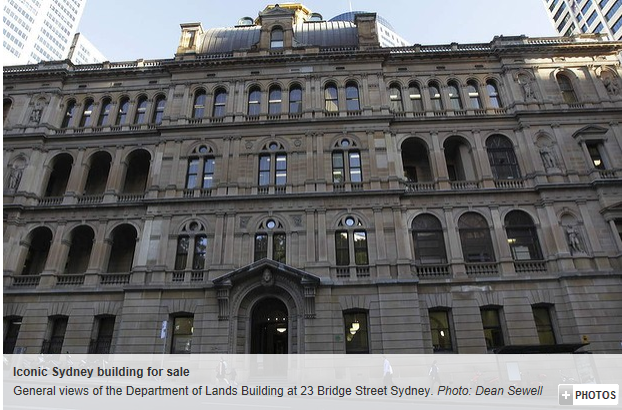 Nicole Hersham, Sydney Morning Herald’s Urban Affair Reporter, comments on the proposed sale of Sydney’s Department of Lands buildings at 23 Bridge Street Sydney. The NSW state government is attempting to sell this iconic Renaissance Revival –style building for use as an upmarket hotel. The buildings are state listed and recognised by the National Trust. Concern surrounds whether there is sufficient demand for another boutique hotel in Sydney and the quality of any future conversion given proposed planning law changes.